Peel and slice the onion finely. Chop the celery and carrot into small pieces. Fry the onion, carrot and celery lightly in a little butter or oil in a large pan. 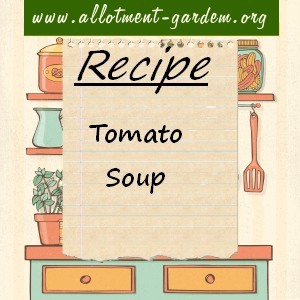 Slice the tomatoes and add them to the other vegetables along with the stock or water, salt and pepper and the parsley. Tie the bay leaf and peppercorns in a piece of muslin and add to the pan. Bring to the boil and simmer gently until the vegetables are tender. Remove the muslin bag and either push through a sieve or put through a blender. Melt the butter in a pan, add the flour, blend well and cook for a minute or two without colouring. Gradually add the puree, stirring all the time. Bring to the boil and cook for at least 3 minutes, stirring constantly. Add the milk and re-heat without boiling. This Tomato Soup Recipe serves 4 – If the colour is a bit on the pale side, add some tomato purée. Serve with a dash of Worcestershire sauce.